Institut Nórdic, the private school led by Arvio and his partners, is a center for Nordic languages and cultures with long traditions. Before the commercial language school activities and incorporation, the association – founded in 1927 – was called Club Escandinavo. It was a place for Scandinavians residing in Barcelona to get together and organize communal activities. 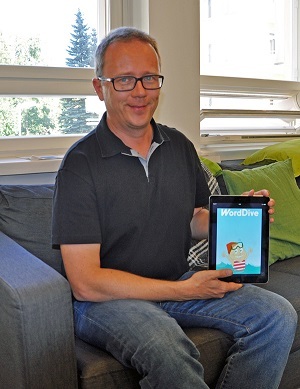 According to Arvio, many grammar areas have been practiced with WordDive to the point that they no longer need to be explained to the students. “In the example sentences students see grammar in practice all the time. When I then show them, for example, a grammar table, they experience an ‘Aha!’ moment”, Arvio explains. In Arvio’s classes there is no need to be afraid of mistakes. “There are more than 2000 ways to end a Finnish word, and there are also 45 different verb types. So it is impossible to produce perfect sentences immediately. This is why I use the red marker very selectively. I think the most important thing is to focus on communication”, Arvio underlines. According to Arvio, the methods that he uses work really well, at least with the Spanish adult students. He also thinks that they could be somewhat adaptable to language teaching in general, or at least to Finnish language teaching for immigrants. ”In Finnish language there are a few complicated things like word types and the changing of the word stems in different inflected forms. For example the word yksi (one) is declined in inessive case as yhdessä (in one). These two forms of the same word have only one letter in common! Such situations cause – even in my classes – momentary distress. That’s why it is vital to get the students to understand that you don’t need to learn everything right away and that making mistakes is perfectly okay”, Arvio points out.